scAn is an in-house tool that has been developed by LVR Optical for the analysis of complex scanning laser effects. It is the world’s first software tool that provides more than just a static analysis of laser effects, instead taking into consideration the temporal effects of exposure, and the consequences of actions such as overlapping beams etc. 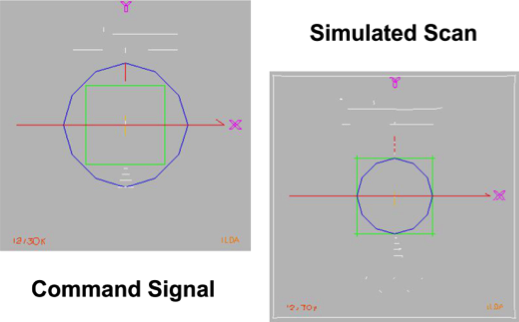 scAn has been used to develop a greater understanding about the nature of laser light show audience scanning exposure. We are able to use it to demonstrate how laser light effects interact with the eye and relate to the exposure limits. It allows us to carry out the most thorough analysis possible on any scanned laser effect or show. Something which is impossible to achieve from just using a standard laser power meter. scAn has evolved from our hardware based capture system, which already, was a unique setup, using a specially modified Kvant laser projector to provide beam movement and intensity data, employing additional sensors installed into the projector itself. This set up provided us with a system that we could capture accurate real-life exposure data from. 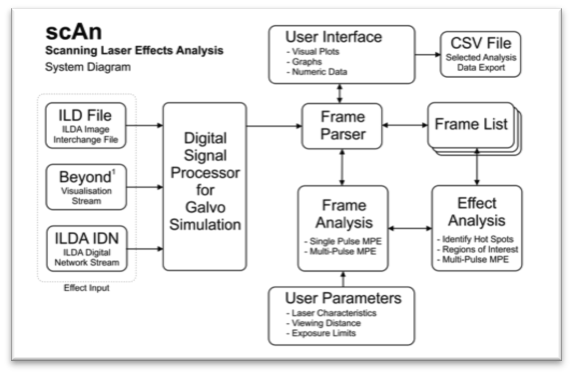 The natural progression from this, in order that we could perform an analysis without always needing to run the laser effects through a physical laser projector, was to develop an entirely software based tool that could be used to analyse and provide exposure data for dynamic laser effects. Laser effects data is collected from either a standard ILDA (ILD) file, or in real-time from Pangolin’s Beyond* laser control software, or an ILDA Digital Network (IDN) stream. The laser characteristics and viewing distance are specified, so they can be considered along with the laser effects data to provide a detailed representation of the exposure created by the laser system, and the relationship with the maximum permissible exposure (MPE) limits. scAn provides us with data relating to the beam velocity and exposure dose, that is automatically compared to the appropriate MPE. scAn provides both a static analysis, and a full cumulative exposure evaluation, creating heat-map data that shows where the problematic parts of an effect exist. A major source of error with performing calculation on a purely software based analyser is introduced through differences present between the scanner command signals and the actual response of the galvanometers. This can lead to underestimation of the effective pulse duration. An example being in the ILDA test pattern where the command signal circle is outside the central square. But on a tuned scanning system, appears inside the square, resulting in different length beam paths, and therefore exposure times. Simulating this behaviour in software reduces the error that would otherwise be present. In summary, the scAn analysis software provides LVR Optical with a unique tool to achieve a far greater understanding of exposure characteristics than just using a power meter or photodiode, that can only ever measure one small part of the scanning field. scAn can instead provide us with very detailed exposure information about an entire laser effect, considering all points within the beam path, and the effect over time. This is useful for demonstrating the exposure relationship of laser effects with the safety limits, and providing a fine-grained assessment. * Pangolin and Beyond are both trademarks of Pangolin Laser Systems Inc.